After the blockbuster success of his Last Jihad series, bestselling author Joel Rosenberg trades in contemporary political thrillers for historical fiction set against the potent backdrop of the Holocaust. Auschwitz is a labor of love for Rosenberg, who was born to a Jewish father and a Gentile mother, and is founder of The Joshua Fund organization to mobilize Christians in support of Israel. The book was inspired by the author’s 2011 trip to the site of the infamous Auschwitz-Birkenau concentration camps where over a million prisoners died at the hands of Nazi atrocities in the early 1940’s. As the book’s title suggests, Rosenberg’s narrative moves the book more in a thriller direction, and becomes something different from simply a book chronicling Nazi atrocities. The book profiles the superhuman courage and dedication of a handful of Europeans, who worked tirelessly and stealthily throughout the 1940’s to raise awareness throughout the Allied camps of the secretive dealings at Auschwitz. These efforts take many faces throughout the book – brave Jewish prisoners, members of resistance groups throughout Europe, and, surprisingly, Christians who took Christ’s call to love one’s neighbor to the extreme, and risked their own lives to aid Jewish resistance. One such character is a French pastor named Jean-Luc LeClerc who, after spending years in the late 1930’s assisting refugees from the Nazis find safe harbor throughout Europe, is imprisoned, then begins working from within Auschwitz to plan a series of escapes, which will ultimately result in the distribution of information about the true situation in Auschwitz. The main character is German teenager Jacob Weisz, a member of a German resistance group. When a rescue operation goes awry, Weisz is transported to Auschwitz, where he watches the atrocities unfold before his eyes as he struggles to survive through a series of jobs. 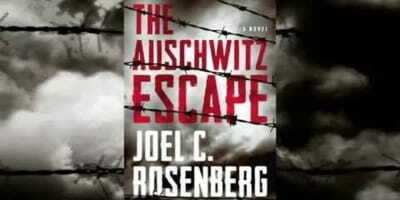 For the reader, experiencing the most horrifying features of the camp –torturous manual labor, abysmal living conditions, and the gas chambers – through the eyes of Weisz, will prove to be a memorable experience, even after similar narratives like Elie Wiesel’s Night or Spielberg’s Schindler’s List. Eventually, Jacob is taken under the wing of a Polish “kapo” called Leszek Poczciwinski, who brings Weisz to work under him in a warehouse dubbed Canada, which collects and re-distrubutes the personal belongings of Jewish prisoners. Soon, Jacob begins to suspect Leszek has more in mind by recruiting him to Canada than simply Jacob’s personal welfare. It won’t take the reader long to realize that the “escape” mentioned in the novel’s title is Leszek’s endgame. The build-up to, and carrying-out of this plan is by far the strength of Rosenberg’s storytelling. Jacob and a half-dozen other prisoners plan their escape past two levels of razor wire fencing, thousands of SS guards, dogs, and eventually, the inhospitable Polish countryside, and this section of the novel fairly flies by. However, the aftermath of the escape is no less gripping. As expected with a novel of this subject matter, some readers will find the content disturbing, despite the tact with which Rosenberg’s renders it. But, although the novel’s final half is scintillating, Rosenberg struggles in the first half to position the pieces and maneuver his story into place. And, often, the prose proves to fall short of the compelling subject matter, pushing hard to communicate emotion when a less direct approach would have sufficed. Still, despite these criticisms, the story of Weisz, LeClerc, and the others, is powerful, and the passion with which Rosenberg delivers this story – obviously one close to his heart – makes it a memorable read.